What happens when you look through old posts? Not sure about anyone else but I definitely have some that I cringe when I read through them and see lots of issues that can be cleaned up. In an effort to work on organizing and getting my blog to the best level it can be I've been working on cleaning up old posts. 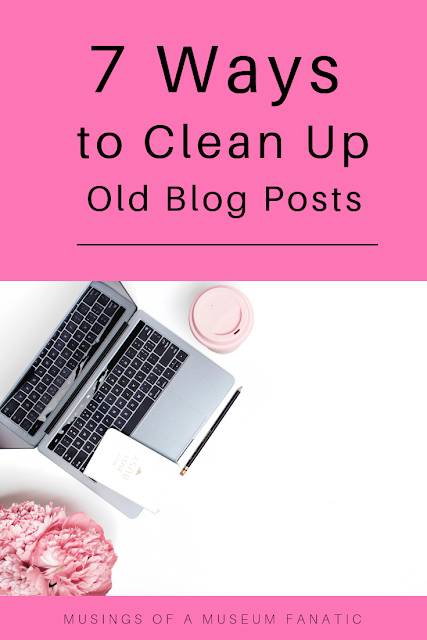 Here are seven ways that I've found to clean up old blog posts. Have you been cleaning up old blog posts? What ways have you been cleaning up your old posts? This is a huge one for me. I'm guessing I'm not the only one. I'm not sure why but at some point I was doing something wrong when it came to images and there are lots of posts that the images are broken now. There are too many that are like that unfortunately. I won't judge your broken images if you won't judge mine. This is slightly different from checking old images. When looking back through my old images I find a lot of offenders that I posted with the black Instagram frame or you can tell that they were taken in the dark windowless kitchen of our old condo. These images can totally be updated. Make that old recipe or DIY project again and take some brand spanking new photos. It's amazing what that can do for a post. I've even gone back and added pinable images to a lot of older posts. If you don't have time at this point to change all the photos at least you can add a pinable image and pin those old posts! It's not a crime to delete an old post. In fact I've read in several places that it can in fact help. Say you participated in a giveaway in 2013 and the post was just for that giveaway there was no other content with it? Go ahead delete that post! It's not doing you any good to have readers see what an awesome giveaway it was and then get sad since they missed out on it. If you write about totally different content now you might want to delete old posts that have nothing to do with what you post about now. This is also an important one. I know we all like to be good bloggers and link to other blogger posts or even better link back to our own. If you're following the second one you might have linked back to an old post that you've now deleted. Make sure to update and remove that link! Did you used to center all the text in a post? Or make your photos small so the text would wrap around and no one could see those awesome images? Well now is a great time to go back and fix those issues. You want to make sure that older posts are looking similar to your new ones. As I was looking through old posts to get ideas of what could be fixed I noticed that I used to do a lot of crazy color stuff. Don't go crazy with colors when it comes to the main chunk of text it makes things reaaaaaally difficult to read. This is an area I know people tend to disagree about. I used to use every tag imaginable so there were tons of different ones in use. Sometimes I would end up with half a dozen on a single post that I would never use again. As someone who uses metadata tagging in their daily work life I was actually being pretty bad about it here. I've worked to simplify and use only a set 6-10 different tags. This makes it so much cleaner when you're going back to find a topic. This is an area I'm still just even working to figure out much less doing it as well as I know I could be. With that being said there are tons of articles that can help both of us with this. Going back and taking a look at how you were writing old posts and changing it up so they're more SEO friendly will definitely be a good thing.